Hata graduated medical school at Wake Forest, and then completed her residency at Vanderbilt in Nashville, followed by a fellowship at Cincinnati Children’s Hospital. Specializing in pediatric pathology and renal pathology, she was thrilled to return to her native Louisville three years ago to be part of the Norton Healthcare team. “With Electron Microscopy, I can see inside the cell to the mitochondria and other organelles.”— Jessica Hata, MD. According to Hata, the specimens the electron microscopy lab recently brought in house are cilia, platelet, and muscle EM, though she hopes to do even more as Norton expands the lab. Norton Healthcare’s special coagulation laboratory also offers sophisticated testing of platelets for patients who present with unexplained bleeding such as excessive menstrual bleeding, recurrent nosebleeds, or excessive bleeding after dental work. 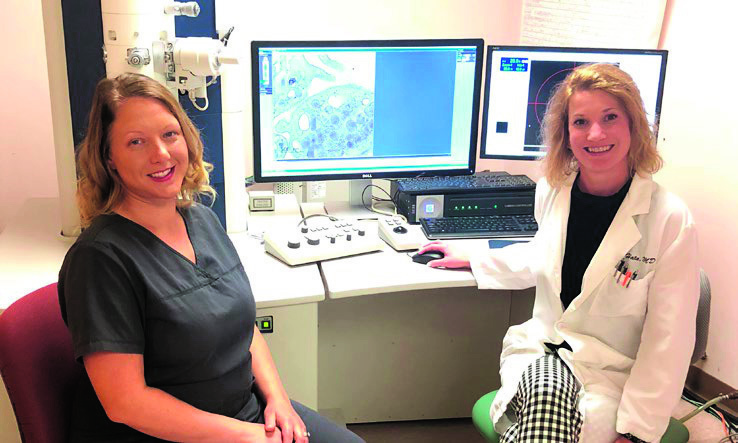 Hata and her partner, Beth Jewell, an electron microscopy technician, embarked on this project together and ventured to Denver Children’s Hospital for specialized training on electron microscopy. The growing team now use EM to assess the number of dense granules in platelets. A lack of dense granules can indicate a disorder called delta storage pool deficiency.